Miimii snapped a picture of me at the Narita Airport in Tokyo as I headed out to return to the United States and my new assignment in Spokane, Washington. I would be working for the 92nd Bomb Wing Intelligence, supporting the B-52 nuclear bombers which sat on alert. My sponsor was Staff Sergeant Don Luna, who I'd raced in June 1987 when I was stationed at Offutt Air Force Base in Nebraska. I was excited to tell him I finally beat his fastest 1 1/2 mile run time. I was just glad to be going back to the United States, but I was sad to leave Japan. As the plane lifted off from Narita Airport, I listened to all the Japanese voices on the radio and thought about the sea of humanity, including some very special friends, whom I would probably never see again. Based on my decent showing in my two years of living in Japan, I assumed I'd become a very strong cyclist and move up through the ranks to a much higher level than I'd achieved in Japan. I looked forward to it...I looked forward to buying my dream car, the Honda Civic Si, and cruising for hours on the great American highways. I looked forward to having my own place. It was a very exciting time. I was thinking that perhaps this is where life will finally begin for me. The picture below was taken shortly after I left Yokota. 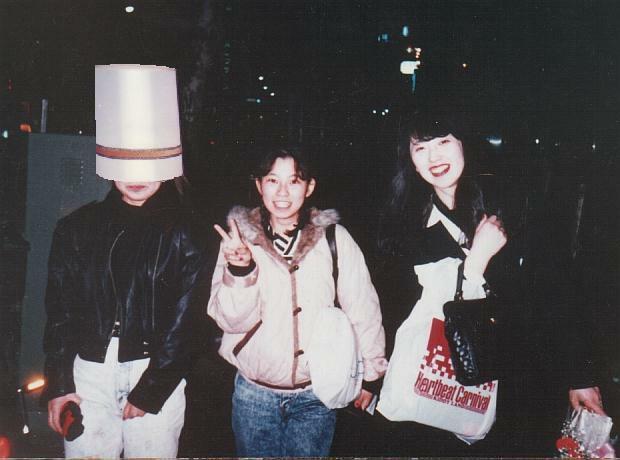 The girl next to Miimii (lampshade) is Kasumi, who was with her when we met.